Tamara Hensick?s motivational paperweight provides a constant reminder to be your best self. Placed on your desk or countertop, this thought-provoking paperweight from designer Tamara Hensick provides a constant reminder to be your best self. 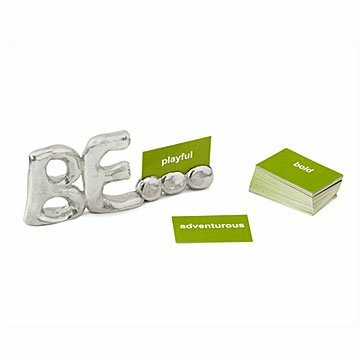 Cast in solid pewter, the word "Be..." is accompanied by a series of cards printed with positive qualities, such as "reliable", "thankful", and "honest". The cards can be displayed in a slot across the top of the ellipsis as a prompt to remember a quality you wish to develop. Or choose a random card each day to focus on a different part of your personal growth. Made in Los Angeles, California. Includes set of 72 inspirational cards. Click here to see all of the included words! I like that it was very unique...and had special words. I actually don't use this as a paper weight. I have on the table in my foyer as inspiration for my family and visitors. Ordered as a gift for two of my colleuges. both loved it! Given as a gift to two of my colleagues for their birthdays. Meant to be inspirational and encouraging. They both keep it on their desk in their home offices. The only comment one made was that the cards were a little small but she still loved it. This item was purchased as a retirement gift for a very good friend. Without me having to tell her what to do with it, she was able to explain to others exactly how it works. She's decided to pick a card at random daily and strive to live her day accordingly. My brother gave me this awesome gift! Love it â�¤ Every few days I randomly select a new word. Sits in my front room. Thank you!